Pashmina was the fabric of royals and emperors. 3 What Is Superfine Wool? The fine undercoat of the Chyangra mountain goat is the raw material used for the fabric known as pashmina. The cashmere cloth comes in various sizes and colors, and when produced with high-quality standards is expensive and luxurious. Pashmina became very popular in the 1990s, and because of high demand for cheap goods, counterfeits infiltrated the market. It is difficult to distinguish a fake pashmina from a real one, but knowing the production process and quality standards can help to make the distinction. Pashmina wool is a highly prized material due to its extraordinary warmth and light weight. A light undercoat from the high-altitude mountain goats, the wool keeps them warm in the extreme conditions where they live. References to the wool are in many historical documents in Nepal and India as the fabric of royals and emperors. Pashmina wool is among the lightest and softest in the world and has a very delicate collection, spinning and weaving process. The skill, experience and time it takes to produce top-quality pashmina are reasons for its high cost. Workers harvest the soft undercoat of the upper Himalayan mountain goats during the moulting season when they shed their longer winter coats. Weavers separate the soft and much shorter undercoat for quality, comb it and hand spin it with traditional spinning wheels. The weaving, again done by hand, is on traditional looms. A high quality pashmina can take up to three days to complete because of the delicate nature of the fine threads used to create the woven material. The more pure pashmina wool in a scarf or other woven product, the more expensive it becomes. Weavers sometimes incorporate a strong silk thread into the weave to speed the process without compromising quality and overall feel. Most high-quality pashminas are 80 to 100 percent pashmina wool mixed with silk or cashmere without compromising quality. The demand for pashminas, and the Nepalese and Indian governments' inability to regulate and control the true pashmina product, resulted in a flood of counterfeit pashminas on the global market. The pashmina became very popular in the U.S., Japan and Europe in the 1990s, and demand for this luxurious item boomed. Cheap knock-offs resulted, and it is very difficult for the average consumer to distinguish between the real and fake pashmina. Experts can recognize counterfeit pashmina by the raw materials used in the fabric. 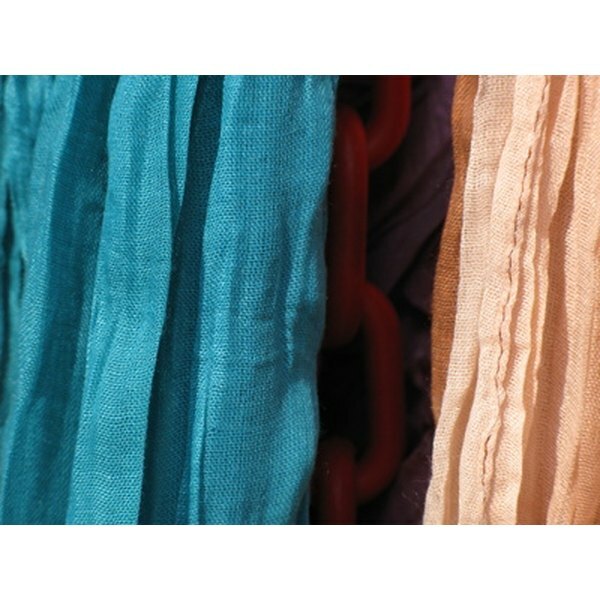 While it is common to mix materials in the production of high-quality pashmina, the added materials must have similar quality. Additionally, the finished product should have no more than 30 percent non-pashmina wool. Counterfeit pashminas mix a high percentage of lesser-quality cashmere or wools like merino, or even synthetics like viscose or rayon, with tiny amounts of pashmina wool and claim it is pashmina. The finishing techniques used on the textiles, adding sheen and luster, mimic the feel and often fool the consumer into thinking the product is 100 percent pashmina. Labels and price are the best indicators of a real pashmina. A real pashmina will have the origin and acceptable percentage, 80 to 100 percent of pashmina, clearly labeled. It should be from Nepal or the Kashmir region of India, and priced from $40 to $80 for a simple scarf. Consumers should be wary of labels such as 100 percent viscose pashmina, 100 percent pashmina feel, or 100 percent pashmina blend, as they are misleading and most likely contain very little pashmina wool. Examine products made in China, or countries other than the traditional origin, with a critical eye. What Can I Do to Prevent a Wool Coat From Irritating My Neck? What Are Persian Lamb Coats?